Lord Zedd watched as the skies above his makeshift command post filled with the might of his navy. Zordon is as foolish as he is predictable. A grin split his face as he stood up from the stone seat that was his throne. Marching out of the command center, he signaled for his master warrior, Rubitron, to join him. “As you command, my master.” With a bow, Rubitron split from the Dark Lord and followed the corridor to the hangar holding the ancient serpentine vessel. The full Power Rangers team, minus the Green Ranger, was assembled on the command bridge of the Sovereignty. Danok, the Blue Ranger, and Alpha 5 sat at the weapons control panels while Umon , the Black Ranger, and Mi, the Pink Ranger, worked at the system panels, attempting to recharge the shield generators while keeping the scanners nominal. The Yellow Ranger, Fenix, stood alongside Zordon at the center console panel, where the planet’s surface and the camp of the Nemesian Empire were displayed across a monitor screen. “Ion cannons are overheating. Laser batteries are at 25% capacity and falling,” Alpha instructed. Danok pulled up a holo of the weapons cache. The Eltarian vessel was not a warship- but she had been outfitted with several classes of weapons for defense. With the primary and secondary systems overworked, he selected the proton bombs as a last resort. “Alpha, keep running the lasers and get us into position to drop some hell fire on these bastards.” Danok ordered. The ship bore down on the forward wave of quadrafighters as it began to descend through Regada’s atmosphere. Streaks of azure fire disintegrated the cluster of ships at the Sovereignty’s bow as her hull began to heat up against the atmospheric resistance. The automaton acknowledged the command. A 5th generation Alpha unit, the robot was capable of multitasking complex algorithms and processing commands with little to no lag in his processor core. “That may work,” Umon acknowledged. He left Mi, who had managed to bypass the ship’s energy gates to push the shields to hold a bit longer, and watched as a faint contact from the morpher crackled across the receiver. “I’ll try,” he returned, keying in commands. The slight warble of the device’s response played once again over the screen’s display. “Alpha, pinpoint the location.” Instantly, the geosynchronous scanning systems displayed the Green Ranger’s location by means of a bright red blip moving across the map of the camp. “They’re moving her,” Umon stated. Zordon glanced up at the forward display to see the snow-capped mountain range bordering the Nemesian camp coming into view. “Danok, find someplace to set down. We have to hurry,” Zordon instructed. “Could it be Serpentara?” Mi asked. “Alpha, power up the Zords. We’ll bring the fight to them.” Zordon said, his helmet materializing around his chiseled face. Having moved Lord Zedd’s prisoner and set his best warrior as guard, Rubitron focused his attention to the evacuation of the outpost. There had been some grumbling in the camp that they were retreating, but that was far from the reality. The Rangers were well- known for being relentless in their pursuits and the fact that they were holding the Green Ranger was not wasted on Zedd’s general. Passing through the crowded inner lock that separated the command center from the outlying camp, Rubitron entered the derelict, hollowed out spindle that had once been a Regadan space freighter’s bridge. “General, the Eltarian vessel has landed and there are now five distinct energy signatures. Scans indicate they are assault vehicles, four terrestrial and one aircraft, bearing at marker nine-five. They will make our camp in less than a minute,” A uniformed human lieutenant informed him. Grabbing a pair of viewers, Rubitron gazed out at the northern border of the outpost and saw dust clouds concealing the shape of the Rangers’ vehicles. In control of his crimson Titan Zord, the Red Ranger kept a tight hold on the control yokes, the bipedal machine lurching forward with each galloping step. In his coms, he overheard the determined outbursts from the other Rangers. Soaring above the attack formation, Princess Mi leveled out her rose armored Zord, having taken the shape of an air-borne, predatory animal known as a Pantheryx. Found primarily in the jungles of Eltar, the Pantheryx was one of the mightiest creatures on the planet when the Zords’, according to their unique design, chose their primary forms. “Mi, we’ve got a squadron of quadrafighters closing in on us- show ‘em what you’ve got!” Danok shouted, watching the display within his azure Kerab beetle Zord. The Kerab was indigenous to Eltar and were known as the keepers of the forest. Felling dead trees with their nearly three meter tall form, Kerabs would eat the dry timber, which in turn eliminated the chances of wildfires in the mountainous regions. “I’m on it!” the Pink Ranger returned, banking hard and bringing the Zord to bear down upon the advancing fighters. From the cockpit of the Lonticore, Fenix, the Yellow Ranger, watched as the command outpost came into sight just over a barren ridge that marked the edge of a once small sea that was now known as the Gaden Wastes. An apex predator of the open plains on Eltar’s southernmost continent, the Lonticore was a massive beast of sinews and claws. “Zordon, there’s a massive hangar port just beyond those tents- I’m picking up the same energy signatures that disrupted our scans earlier. It might be Serpentara,” Fenix declared. As they passed through the camp’s perimeter, the Zords held their formation and headed for the open hangar port. “Milord, there are several unidentified vehicles approaching from the north. Shall we hold the launch cycle?” One of Serpentara’s human pilots asked as Lord Zedd stepped onto the bridge. “Allow me to identify them for you- they are the Zords, the mechanized transports of Eltarian Rangers, so named for the Red Ranger, Zordon. He is as foolish as he is proud. Charge the disruptor cannon and prepare for attack formation,” the dark lord returned. Last edited by BattleRanger; December 15th, 2017 at 08:39 PM. Sneak peek at Chapter Seven, coming in January. *Note- changed the sneak peek as I've decided to move parts of the story around. The Temple of Typhonis stood at the very center of the Eltarian capitol of Andros City. Flanked by massive statues of the five Guardian Beasts, it was the home of the order of Morphing Masters. Within its walls, the twelve Morphing Masters interpreted the Morphing Grid and oversaw the actions of Power Ranger teams across a dozen worlds. From the temple, Ranger squadrons were dispatched to bring peace to war-torn systems within the Confederation, as well to protect the very source of life, the Zeo Crystals. Last edited by BattleRanger; December 26th, 2017 at 11:23 PM. 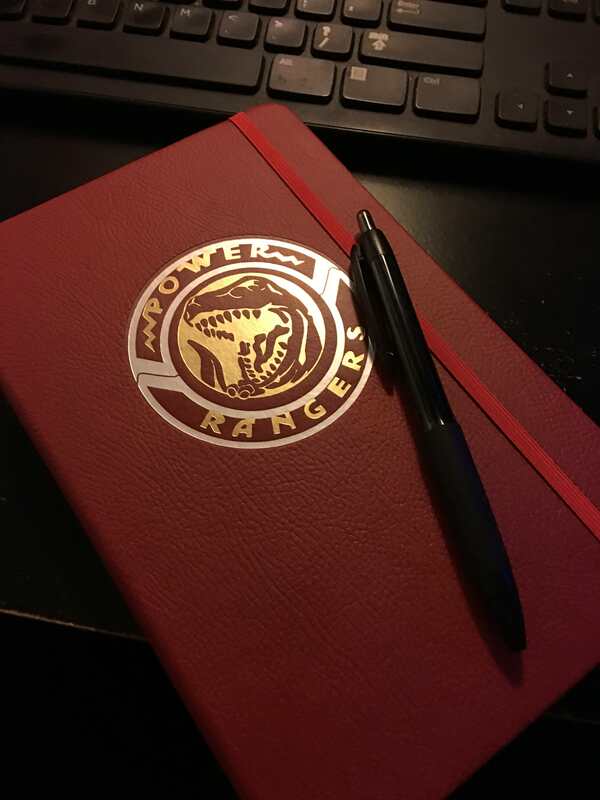 Got this Insights Edition Red Ranger journal, which will be housing all future chapters of The Battle Begins. Today at work, I outlined the remaining chapters and it looks to be about 20 chapters long, with a few thrown in as flashbacks. Last edited by BattleRanger; December 28th, 2017 at 10:48 AM. Dressed in solid white robes bound by gold breastplates, the Morphing Masters sat in cylindrical chairs spread across the outer wall of the chamber, each designated by the tribal symbol of each of the Ranger teams under their command. Master Amit, the council member representing the Eltarian Rangers, stood and addressed his fellow councilmembers. The council whispered amongst themselves while Amit stood patiently. Finally, the Tryforian Master, Strand, spoke. “The council agrees to hear your nomination, Amit.” Stepping from the shadows, Rita Repulsa glanced around at the council and swallowed past the hard lump in her throat. “Thank you. For the rank of Green Ranger, I nominate the champion of the City Games, Rita Repulsa. For her bravery in the face of such competition, her humility, which knows no end, and her intelligence in the face of overwhelming odds, I ask that the Morphing Grid show her true heart to you all so that she may bear the mantle of the Green Ranger,” Amit said, as the recessed matrix at the room’s center suddenly came to life. Hovering above the matrix, a flickering orb of light spun as the Masters sought the answers in its images. Then, without warning, the luminescent globe vanished. A low hum came from the matrix as a deafening explosion rocked the temple. The windows shattered upon the impact of the blast, sending razor-sharp daggers of glass across the room. As if by instinct, Rita grabbed Amit and shoved him to safety behind a fallen table. A terrible screeching sound filled the air as darkness descended upon the temple. Amit recognized the call of the dragon, Serpentara. A trilling alarm sounded within the temple as a squad of temple guards, dressed in red Ranger-esque crystalline armor topped by gold breastplates, filled in. As the temple guards helped the Masters to safety, Rita caught a glimpse of the green and gold Dragon Dagger at Amit’s feet. Without warning, Nemesian troops stormed the chamber, blasting the temple guards with black blaster rifles. Slowing her breathing, Rita flipped over the table and grabbed the Dragon Dagger in one swift, fluid motion. Armed, she dove into the midst of the Nemesian troops, slicing with the energy blade of the dagger and utilizing her combat skills to fell the troops. Each determined strike came with purpose- no motion was wasted. One by one, the Nemesian diamondbacks were obliterated by the potential heir to the Green Ranger powers. As the last troop landed on the hard floor, his helmet cracked to reveal his mortal wound, the chamber went silent. Focused in a crouch, Rita opened her eyes and took in the scene. The burnt smell of ozone penetrated her nostrils as her ears rang from the concussive force of the blast. Outside, the battle waged on- but, for the moment, the chamber was silent, and the council of Masters was safe. As she helped Amit to his feet, Rita spun the dagger by the hilt and relinquished it to the Eltarian Master. Shaking his head, Amit gently shoved the weapon away. “Keep it. My apprentice sensed it, even when I could not- the Morphing Grid has obviously chosen you. Your power protected not just yourself, but the entire council as well.” Around the room, the confused and stunned council of Masters echoed the Eltarian’s sentiments. Last edited by BattleRanger; January 6th, 2018 at 09:02 AM. I was just looking for some interesting stories and stumbled onto yours. I think you're a talented writer because these stories have seriously got me hooked. Cant wait for chapter 8. Thank you for the kind words. I'm very glad you're enjoying the ride. If you are looking for more, I've written a few other fics as well you may enjoy. Last edited by BattleRanger; January 3rd, 2018 at 11:04 PM. I'm going to need someone to come and pick me up off the floor for all these amazing Easter eggs. I fell out of my seat when I came across "call the 5-4-1." You are the freaking man. haha! I love the background influences you've incorporated. It feels like the Rangers are a Green Lantern Corps type organization now, with the Masters as the Guardians. It translates so well! Beautiful, concise, and effective descriptions of the Zords. I love the concept that they can reassign their forms to where their teams are from. Sounds like a MUCH better version of Legendary Zords from Super Mega Force. You, my good sir, are a creative genius. You know how I like Easter Eggs, lol. Thank you sir. You're gonna freak over the things I have planned for this. I have a few questions for those of you who are reading this fic- what do you expect from a prequel / sequel to the movie? After watching the movie numerous times, I have alot of ideas for a sequel and I wanna see what you guys think. Personally, I feel like the Apex group introduced in the Aftershock graphic novel were probably overseeing the Cascade mine where Billy's dad worked at. I also imagine his dad discovered quit a bit of Eltarian tech, maybe even weapons and / or upgrades. Even Billy said that his dad had found a lot of old stuff while digging there. It would probably make sense too that whatever accident his dad died in, it was probably caused by Apex. I also can almost sense a thirst for power in Zack. With a dying mother at home, who's to say he won't possibly make a grab for the Green Ranger powers (which has some basis in the Boom comics continuity) in order to have the ability to heal his mom? 100% agree with your thoughts about Billy, Zach, Apex, etc... It also feels a lot like Grace Sterling/Promethea from BOOM. The number one thing I want out of this new franchise is not being afraid to explore new stories but pepper in Easter eggs. I think acknowledging that this fandom can finally grow up and be grittier is one of the smartest things Saban has done. I’m not afraid to have the story be finite as well, I don’t need an infinite amount of material. Agreed with you. I am excited that Boom are doing this Promethea arc and giving us littel things like an early version of Terra Venture with their base. I absolutely love the Boom series. I just hope to God they will visit some of the early Ranger history, like the movie did with its opening scene. I personally would like to see the Trini/Kimberly friendship expanded upon in a potential sequel. It would be nice to see two contrasting personalities develop and how their friendship could have flaws as opposed to the version in the TV show without drifting into the Kimberly/Trini shipping. Eh, TBH, that friendship in particular probably won't get much focus if I end up writing it in a fanfic. I never found the Kimberly / Trini friendship to be that fascinating. Same. I think these characters have a lot ahead of them. Movie-verse or otherwise. I’d like to see where Trini would end up with all of her skills. She was a gifted fighter, international diplomat in training. A version of her I wrote had an interesting future set in the world of espionage and politics. But back to this piece, haha. Another thing I’d like to see is if Rita ever accesses this power to become the beast she is channeling. Is that what drives her over the edge??? Agreed. I haven't given a whole lot of thought to this, really, not since my PR Saga fanfic went on hiatus. I personally wouldn't follow characters outside of the team, unless they had some kind of direct influence on the story's events. Just a little bit of an update guys- the story continues, I just have been sick with the flu and getting bounced around at work so I haven't really had much time to finish Chapter Eight just yet. Just please be patient- I sweat this isn't abandoned. You have to get better soon so you can keep this up! Haha! Without dispute, the great beast known as Serpentara was the largest vessel in the Nemesian fleet- however, it was deceptively quick for a vessel of its size, able to achieve speeds in excess of thirty-five thousand kilometers per hour on its own merit- and its class four hyperdrive meant it could sustain sublight speeds for no more than six hours before recharging. As it lifted off from the open hangar bay, Serpentara overshadowed the five Zords of the Eltarian Power Rangers. Shifting its lower torso, it landed just beyond the makeshift space ports on its massive hind legs. Standing upright, its arms folded out from its body, as its head shifted forward. From the cockpit of his Thoat Zord, Umon watched Serpentara’s transformation with urgent trepidation. “That’s a new trick,” he said, glancing across the field to the Red Ranger. “Give them hell!” Zordon shouted, firing the Titan’s repeating blasters at the serpent. Zordon watched helplessly as the rounds impacted against Serpentara’s hull with no damage. He slammed his fist against the console in frustration and keyed up his comm. “Mi, angle your cannons to hit those joints in the armor. That will be our best shot,” the Red Ranger ordered. Diving across the torso of the massive machine, the Pantheryx Zord unleashed a salvo of supercharged bursts of energy that had no effect on the great dragon. “Milord, the plasma batteries are at full charge,” Rubitron instructed, as he stepped onto Serpentara’s bridge. The dark Lord of Nemesis then gave the order. “Fire when ready.” From the neck of the ancient dragon came tendrils of electromagnetic energy that coalesced into a single spark within the dragon’s maw. A massive bolt of plasma burst forward from the growing spark, setting the air ablaze. Striking the five Zords, the blast ripped through the earth and sky, rocking the great dragon with its own concussive force. The full discharge cycle of the cannon completed, Zedd peered through the clouds of smoke to survey the damage. From the inferno left in the wake of the blast, the other Rangers heard the command and followed. Danok was surprised to find that there was enough energy left in the Zords to process the command. From hidden ports on the Zords came slender flexweave tendrils of nanobots that stretched across from Zord to Zord. Each vehicle itself underwent its own individual metamorphosis, taking a humanoid shape. Where the five Zords once stood, now came the avatar of the Great Beast God, Typhonis. “Rangers, even in this form, we cannot withstand another burst. That cannon will take some time to recharge, so let’s make the most of it,” Zordon instructed. Charging across the battlefield, Typhonis drew two jagged swords from its back as booster engines in its feet fired up. Cross the space between itself and Serpentara, Typhonis dove at the great dragon blade first. The insurmountable size of Serpentara was its greatest defense. The combined might of the five Guardian Beasts posed little threat to Zedd’s monstrosity. However, what the assembled Zords lacked in size, they more than made up for in speed. Striking and moving, Typhonis was never in the same airspace around the serpent for very long. A full-size Lamian male, Goldar stood in the corner of the small chamber, his ravensteel wings folded against his broad shoulders. He had accepted his assignment without complaint, but he knew he was better suited for more pressing matters. His brother, Silverback, had been promoted to war general, as had his uncle, Rubitron. Goldar knew his time would come- and while he respected the command of the human who had assigned him to such a menial post, he now questioned why he was guarding a female human no larger than the dinner he had had the night before. Sitting across from the golden-hued warrior, Rita Repulsa contemplated her own fate. She had successfully executed missions of great discretion all across the stars, whether it was reconnaissance missions to Tryforia or sabotaging rebel terrorist on Analast. She had more than earned her reputation as one of the greatest spies in the Eurolean Arm. However, it would seem that her luck had taken a drastic turn for the worst. Concussive forces rocked the chamber, forcing Goldar to brace himself against the door frame. He grumbled, mostly to himself, and re-centered his mass. “What do they call you, goldenrod?” Rita quarried. Goldar barked an incendiary response that failed to offend the Green Ranger. Smirking, Rita returned the volley. “So says the one sitting captive,” the Lamian returned. “Are all female humans such masters of language?” he asked. Rubbing the edges of an open wound on his arm, he growled low. A quick inventory of his breast sleeve produced a small nugget of gold which he eyed with particular interest. While most members of his family practiced forms of tribal magic, Goldar had always fostered a penchant for the arts of alchemy. As the golden hued metal began to curiously change from solid to liquid, the Lamian carefully introduced the deposit into his wound, the elemental tendrils seeping into his skin and bonding to his form. Invoking the mystical transformation, Goldar felt a cold strength rush into his body, his hairs standing on end. Rita sat in awe at the healing that had occurred right before her eyes. Ever the opportunist, she decided to bide her time, recognizing that the hulking monstrosity may have more worth as an ally than her enemy. Rita held the green Power Coin in her right hand as she examined it. A golden, metallic coin with specific patterns designed to conduct and amplify the powers within, at its heart sat a rounded fragment of Zeo crystal. Forged by the very first Morphing Masters, the coins had been initially a means for their bearers to access the Morphing Grid directly and assume the physical shape of their individual Guardian Beasts. However, such powers ultimately proved too much for their hosts. Eventually, the coins were used to focus the power of the Morphing Grid into suits of armor and weaponry that were stored within the coins themselves. Such connection to the Grid not only amplified their strength and fortitude, but gave them a sort of preprogrammed knowledge of fighting styles, battle tactics, and weapons and technology skills. It was a blending of old-world magic and cutting edge technology. Rita had only the most rudimentary knowledge of how the coin worked. She had completed a successful bonding with her powers and now, she needed only to focus her mind and will her powers into existence. In a flash of emerald light, the Morphing Grid opened up, searing the armorweave of her tector suit onto her body. Her coin levitated into the air from her hand, spinning slowly and connecting to its harness at her waist. Solid armor plates then materialized over the suit as the burst of light coalesced into a single spark of energy within her breastplate. The metamorphosis complete, the Green Ranger now stood where Rita had stood only moments before.